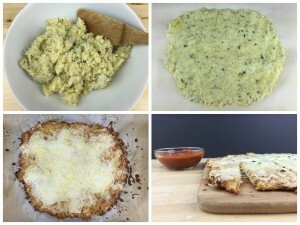 Try these delicious low carb gluten free cheesy breadsticks made with riced cauliflower, Italian cheeses and held together with eggs and our low carb gluten free breading and crusting mix. Line a baking sheet with parchment paper and spoon the cauliflower mixture onto the pan, using your hands to form it into a rectangle. Remove from the oven and top with the remaining mozzarella and parmesan cheeses.